A clever construction of colourful pieces using different stitch patterns creates this versatile accessory. 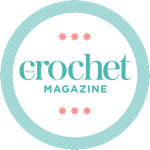 Find this project by Annelies Baes inside our latest issue of Inside Crochet, available to order online and download directly to your smart device. Annelies tries to make a difference by creating on-trend designs that inspire people to use their own imagination and play with colours! View more of her designs at www.ravelry.com/designers/annelies-baes-vicarno.